Book the Terramar Hotel Lllafranc, cheap rates. Terramar Hotel Llafranc: A 3 Star hotel located right beside the beach in the peaceful Costa Brava resort of Llafranc, the Hotel Terramar has 53 rooms and was fully renovated in 2002. Rooms have air-con, TV, mini-bar and safe. Telephone Number: (0034) 972 300 200. Fax Number: (0034) 972 300 626. Terramar Hotel Llafranc: A popular choice for accommodation in Llafranc, the 3 Star Terramar Hotel is in an ideal location overlooking the beach, hotel facilities include restaurant, bar, TV lounge, gymnasium, sun terrace, conference rooms for business users. A charming little Costa Brava resort with a safe, sandy beach and an attractive harbour, Llafranc is still mostly unaffected by tourism, though favoured by the rich of Barcelona and becoming increasingly popular with UK holidaymakers. Nearby places to visit include Begur, Tamariu, Palafrugell, Calella de Palafrugell and Palamos. 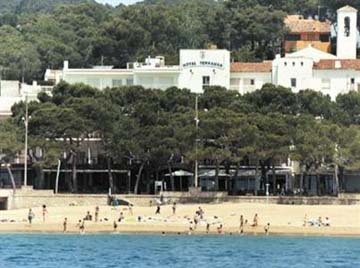 Llafranc can be accessed from the C-31, it is about 40km from Girona and 130km from Barcelona. Llafranc Car Hire: Book Car Hire.